Breeders are listed below the breed description. Contrary to what you might think, though, I don�t just sit on top of my dog house all day and visit with my little bird friend. My breed was developed in England and my ancestors were great hunters, just as I am. I can track anything, and I thoroughly enjoy following a scent wherever it takes me. I get carried away when I get a scent and there's no telling where I'd end up. That is why my people have to keep me secured in a large yard. I have to admit that I tend to be a little loud sometimes and a few people I�ve met might tell you that I have a stubborn streak, but I�m really a very pleasant sort who likes people and kids and my coat isn't hard to take care of at all. I'm not a lot of bother like some of those fancy breeds. I'm just a lovable hound dog. When fully grown, I am between 12 and 15 inches tall (30.5 to 38.1 centimeters) and I weigh between 18 and 30 pounds (8.1 to 13.5 kilograms). � 1996 - 2008 Dogs4Sale.com. All rights reserved. Photo � 1995 - 2008 Corel Corporation All rights reserved. Used under written license. We have no Beagle Breeders listed at this time. 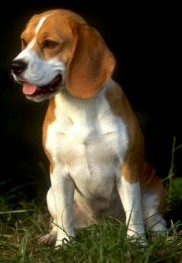 Click here to place your Beagle Ad!